Imaging modalities and diagnostic tools such as magnetic resonance imaging (MRI), positron emission tomography (PET), Raman spectroscopy and optical coherence tomography (OCT) provide excellent anatomical and functional information. However, these cannot currently be readily combined and used in the interventional setting. This results that interventional procedures are frequently carried out under conventional fluoroscopic guidance alone, while diagnostic tests must be carried out separately. Therefore, patients are subjected to doses of ionising radiation and contrast media, and diagnosis may be delayed. The goal of the Integrated Interventional Imaging Operating System (IIIOS) consortium is to provide technology and training for the operating room (OR) of the future, where multiple modalities are combined to optimise outcome for both patients and staff. Workflow and ergonomics for the integrated suite (University of Dundee); Catheter guidance and tip tracking in MRI (University of Dundee, Oslo University Hospital, GE Medical Systems); Integration of Raman spectroscopy and OCT into the interventional imaging environment (University of St. Andrews); Image-guided endoscopic and cardiovascular navigation (Oslo University Hospital); Clinical and technical issues in navigation and intraoperative ultrasound image-guided procedures (Norwegian University of Science and Technology); Clinical and preclinical testing of procedures / procedure development / clinical applications (University of Homburg Saar; Oslo University Hospital, GE Medical Systems); Human-machine interfacing and simulator interactions (Delft University of Technology); Advanced steerable and articulating instruments (Delft University of Technology); MR safety and compatibility testing (MR:Comp GmbH); Anaesthesia and anaesthetic equipment / monitoring for imaging / interventional procedures (University of Luebeck); Novel technologies for image-guided interventions (Fakultni Nemocnice u sv. Anny v Brne); Resonant markers (GE Medical Systems). Collaboration between the partner institutions is a key part of the network, and researchers working in complementary fields meet regularly to share expertise and resources. This helps to promote progress. As well as a comprehensive scientific program, IIIOS aims to provide excellent training and education opportunities to young researchers. The project incorporates 13 Early Stage Researcher (typically PhD student) and 6 Experienced Researcher (typically postdoctoral) posts, each benefitting from the dedicated IIIOS training events hosted by the partners. Seven courses have been run to date, with a further twelve throughout the course of the project. These events enhance researchers’ transferrable skills and scientific knowledge. 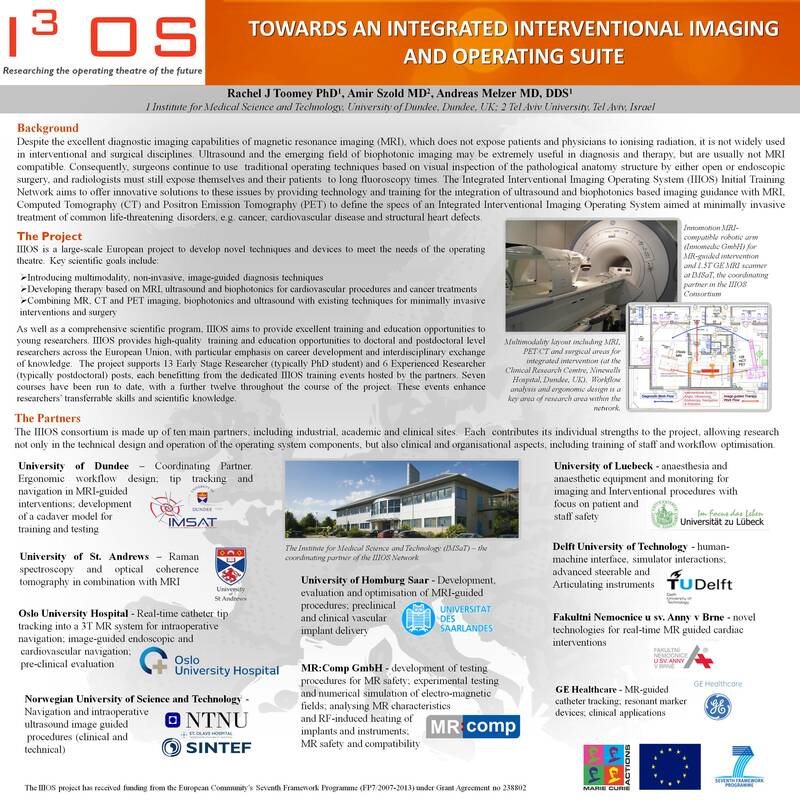 In addition to the progress made in individual research areas, the IIIOS network’s successes to date include multiple presentations / posters at international conferences, and the hosting of special sessions at the 2010 annual meeting of the Society for Medical Innovation and Technology in Trondheim, Norway. The network has had an auspicious start and promises to lead to significant advances towards the integration of imaging, diagnosis and intervention in the OR of the future.